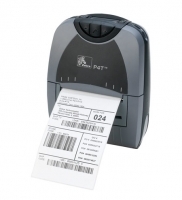 The Zebra P4T sets standards in terms of mobile printing it makes a mobile printer available to you that prints labels using thermal transfer technology. This device is of interest wherever a mobile, robust, easy-to-handle label printer is needed. Thus, it is ideal for restaurants, field work and retail. The P4T offers the functionality of a thermal transfer printer in a handy casing and also guarantees high performance at all times. The Zebra P4T prints receipts and vouchers of a width of up to 104mm with 8 dots/mm 203dpi at a maximum speed of 76mm per second by thermo direct. Thus, you will print high quality labels and receipts in even harsh surroundings, being legible for up to ten years This device is ideally protected against external forces, equipped with the optional protective- and carrier case the printer lives up to the IP54-standard. The Zebra mobile printer can be operated easily and it can be carried comfortably next to a persons body. Its LCD-display, which can be found at the top of the printer, is well-legible, even while carried fastened on a persons belt. All relevant information, such as the status-report, the battery indicator, etc. is shown very clearly. Thus, the employees productivity will be increased, ensuring the ergonomics of his/her actions. You can optionally buy the Zebra P4T with the Bluetooth 2.0 or WLAN 802.11b/g. Being protected by safety protocols such as WPA, WPA2 and VPN, these cordless models can be used for all existing networks. Optionally, you can also acquire our thermo transfer printer as an RFID-type. The RP4T prints and inscribes labels with its RFID-information for a solid-state capture of transponder-data in logistics and production. Equipped with the UHF EPC Gen 2 Standard, you will professionally transform voluminous applications by using the Smartlabels.